Today, I had the pleasure of hearing both Thomas Guskey and Lee Ann Jung share their expertise on Standards Based Grading in Arlington Heights, Illinois (#sblchat). The day-long conference is the first in a series of five face-to-face and online discussions on the components of SBG and implementing a standards based reporting process. If you aren’t familiar with Guskey and Jung, they are authorities on the topic from University of Kentucky, Lexington. Handouts from the session can be found here. My district has not adopted SBG, however math educators in our middle schools have designed common assessments with SBG in mind. Some of us have implemented a quasi SBG approach given the constraints of our percentage-based report card system. Our district appears invested in SBG by sending several representatives from the elementary schools and a few representatives from the middle schools to learn more about the topic. Often teachers embrace a grading practice because that’s what they experienced when they were in school—myself included. It took me several years to evolve and I’m still evolving. Guskey began with three guiding questions that continue to stretch my thinking. Why do we use report cards and assign grades to students’ work? Ideally, what purposes should report cards or grades serve? What elements should teachers use in determining students’ grades? 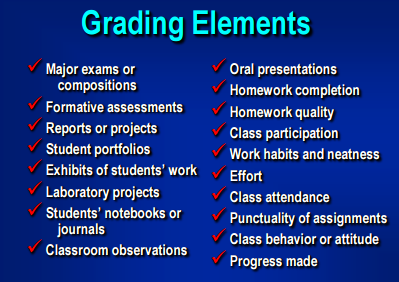 He also reminded us of the various purposes of grading. Document students’ lack of effort or inappropriate responsibility. As educators we need to establish a common purpose on what grades are for, identify the purpose, then identify the method of communication or documentation. According to Guskey, ninety percent of parents agree the report card is for them. If the purpose is to report on student achievement the grade can get muddied with more than a dozen grading elements. Educators need to have a common understanding on what counts for a grade. Jung focused on the importance of 1) sharing learning targets with students so they have clear expectations and 2) providing formative feedback so students have the opportunity to meet the standard. A featured take away was her GPS analogy. When driving we care more about where we are now and the turns we need to make in order to reach our destination. A report card should reflect that as well. If the purpose of a report card is to reflect where the student is at the end of the marking period, it should not be based on averages. Guskey shared how grade reporting becomes more subjective when more categories or levels comprise the grading scale. For example is a student precisely 86% proficient on a concept? He may have earned 86% on the correct number of items on an assessment, but what best describes a student’s level of proficiency? Or, on a learning target if a student earns a series of four 1s and ends the marking period with two 4s on a 1-4 scale, what grade do we report? The heart of the matter is to use informed professional judgment instead of mathematical algorithms. In the next session the two will share their thoughts on grading exceptional learners.